WELCOME TO THE WORLD’S GREATEST INDUSTRIAL CITY! In visiting Manchester for the first time, maybe from Vladivostock or Vanuatu, or even Virginia Water it might not be obvious where you should head first. So we thought we’d help you find the sights that make Manchester magnificent. Gloriously unspoilt Tudor buildings near Victoria station where the mediaeval Lords of the Manor of Manchester lived. 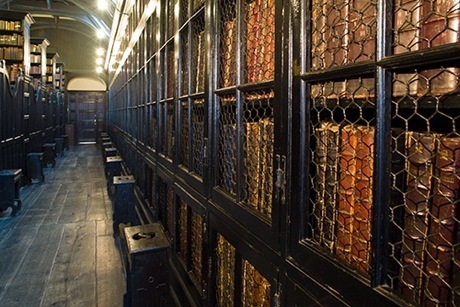 Rebuilt as a college of priests in the 1420s, the buildings were bought up by cloth merchant Humphrey Chetham two hundred years later as a school and library. 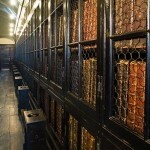 The library is Europe’s oldest and was where Marx and Engels researched The Communist Manifesto. The school is now Britain’s most prestigious music school. (Open weekdays only). Daniel Libeskind’s three theatres of war in Trafford Park by the Ship Canal, on the edge of a city damaged but not destroyed by the Nazi bombs, converge to explain how war shapes lives. One of the world’s great libraries stands on Deansgate, the main road running north-south through the city centre. Here can be found the oldest piece of the New Testament in existence and a reverential monastic air created by the glorious Gothic architecture. An unrivalled collection of Pre-Raphaelite paintings including Holman Hunt’s religious satire, The Hireling Shepherd, and Ford Madox Brown’s monumental Work can be found in the gallery on the corner of Princess Street and Mosley Street. The Lowry and Valette room showcases impressionist scenes created by the Frenchman who taught the local Lowry. Henry V’s Collegiate Church, built in the 15th century Perpendicular style, boasts the wittiest mediaeval choir carvings in the country and a history dating back to the 8th century Angel Stone. More than just a football ground, the home of the modern day game’s most successful English club contains the area’s most visited museum and a hundred years of history personified by the statues of Busby, Best, Law and Charlton. Castlefield centres around this sprawling site showcasing the earliest cars (Rolls Royce began in Manchester), trains, planes and engines. Within the museum is the world’s first railway station which opened in 1830 and much to see relating to how the atom was first split in Manchester and the computer created here. A national museum housed in an ultra-chic corroded steel shell by the river on Bridge Street, just off Deansgate, is devoted to the people’s fight for democracy and political rights. 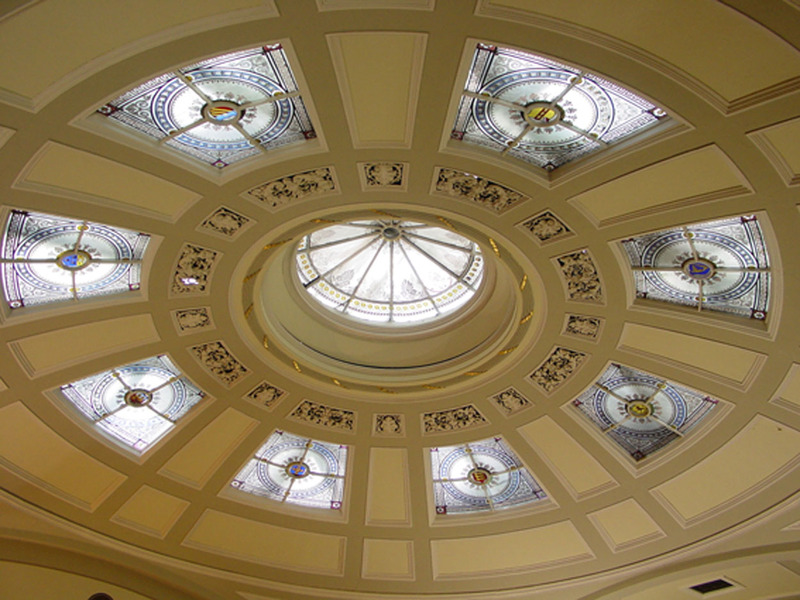 A private subscription library set at the top of an exquisitely decorated Classical building of 1806 on Mosley Street patronised by Richard Cobden and Elizabeth Gaskell, visited by Charles Dickens, and used in recent years by Eric Cantona and Guy Garvey. This was the only place to read the daily newspapers before the railways brought news from London and the rest of the world into Manchester on a daily basis. And it was here that the banquet for the opening of the world’s first ever railway station, Liverpool Road, a mile away, was held in September 1830 – without the guest of honour, the Duke of Wellington, who couldn’t face making his way past the mob that was gunning for him at the terminus. Temporary art exhibitions regularly take place which non-members are welcome to visit. 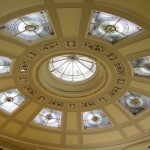 (www.theportico.org.uk). Theatres, cafes and a gallery devoted to the great industrial painter are housed in a futuristic building of bold metallic shapes on the banks of the Manchester Ship Canal.